Introduction to the Delta Wye transformer connection Part 1. This is the first part of the series to the introduction to the Delta Wye transformer connection. In this series, we're going to heavily focus on the Delta connection for obvious reasons. I found the delta connection to be much more complex, confusing, and easy to mess up compared to the Wye connection. 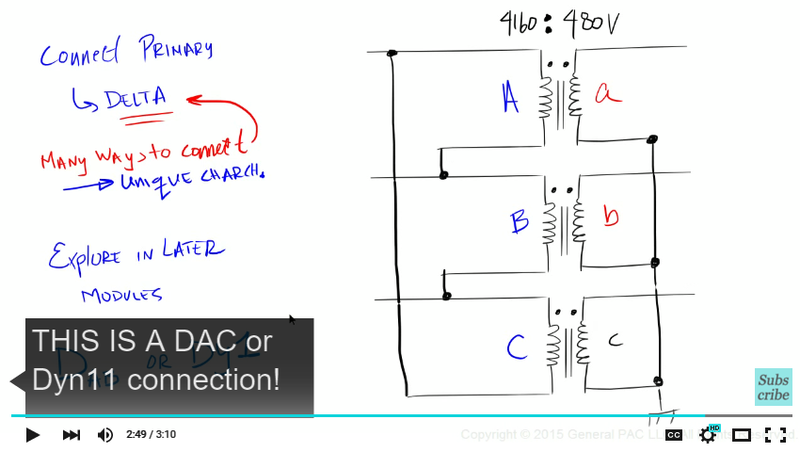 In this module, we're going to simply draw and observe the Delta Wye transformer connection. 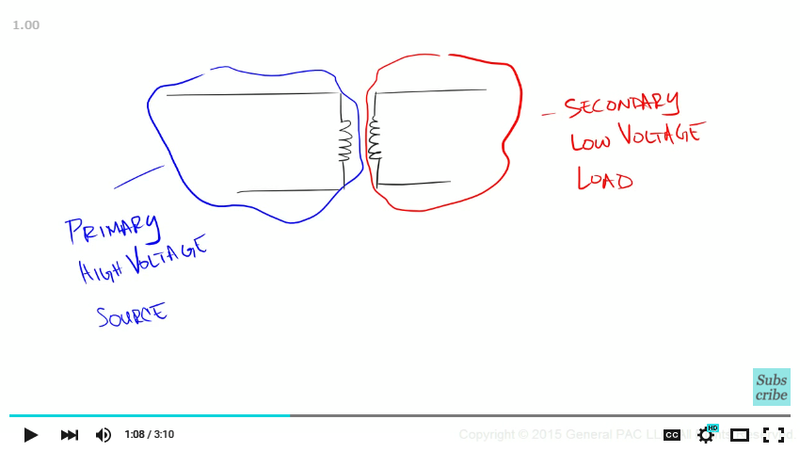 In Part 2, we'll look at voltage quantities. Check out the resources section under this video for helpful comments, suggestions, and clarifications. There are other videos listed in the resources section that will help us better understand this transformer connection. 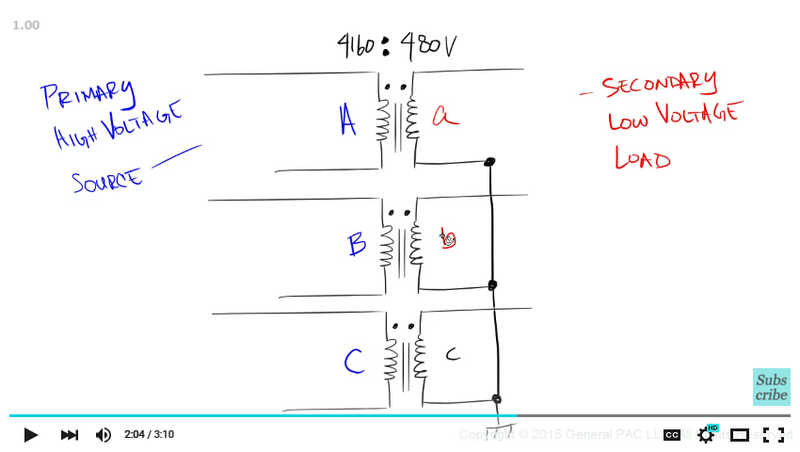 Let's begin by drawing a single phase transformer with two windings. We'll assuming the winding on the left is the primary side, the HV side, or the source side. And the winding on the right is the secondary side, or the Low Voltage side or the Load side. We'll draw our polarity marks to indicate the polarity side of the winding and we'll also indicate magnetic coupling with two parallel lines. And lastly, we'll assume that the primary line-to-line voltage is 4160V and the secondary line-to-line voltage is 480V. 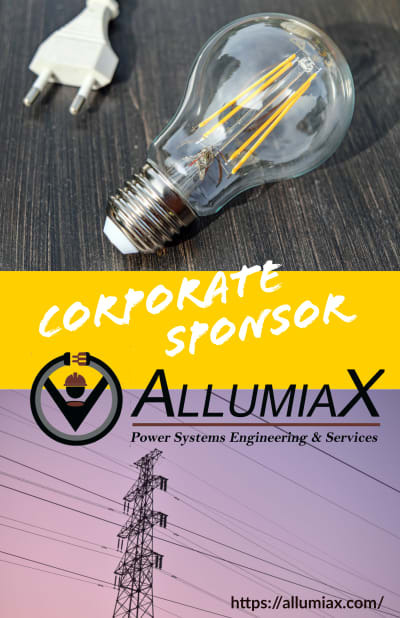 What we have so far is a single phase transformer – and we'll assign capital A on the primary winding and a lower case to the secondary winding. To make a three phase transformer, we'll simply add winding B and winding C.
Since we're illustrating a Delta Wye transformer connection, let's start by connecting our secondary winding in Wye. We're going to connect winding a, winding b, and winding c together. And for the sake of simplicity, we're going to ground the neutral wire. This is Wye grounded transformer connection. The wye grounded transformer connection has different characteristics then the Wye-ungrounded transformer connection. This will be discussed in a different module. Now we're going to connect the primary windings in the delta. There are many ways to connect a transformer in delta and each connection gives us a unique characteristics. We'll explore different delta transformer connection in later modules. One of the most common delta connection is called a DAC or the Dyn11 connection. And we'll draw this connection like such. And this my friends, is a Delta Wye grounded, 3 phase transformer connection. We'll cover line-to-line voltage and phase voltage quantities in Module 2. This module was brought to you by GeneralPAC.com making power system Protection, Automation, and Controls intuitive.